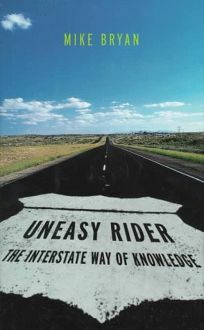 Written as an antidote to those on-the-road books that purport to find the ""real"" America hidden along its back roads and byways, this upbeat account claims to have found the real thing right out there in plain sight along the interstate highways that run between Dallas and California. Bryan, who is from Texas and has written about baseball (Baseball Lives) and golf (Dogleg Madness), says that most road-book writers seek to find ""the rare, the poignant, the quaint, the throwback, the eccentric, the forgotten, and the arcane,"" while what he found is ""the asphalt and concrete wave of the future,"" and it's not that bad. That includes--within a few miles of each other in Texas--a snake farm, a religious theme park, a flag service car company that escorts extra-wide vehicles and a booming stud farm. Making his way west, Bryan rides with state troopers along a stretch of I-20 near Abilene, visits a town so small it can't afford to put up a sign on the interstate but is famous locally for being the place New York City dumps its sludge, and talks to everyone in sight: truckers, motel workers (desk clerks turn out to be terrible gossips), toll collectors, hitchhikers, border patrolmen, road repair crews, even a man riding in a covered wagon. He visits trailer parks, a courtroom, a dairy farm, hot springs and--in El Paso--the reclusive novelist Cormac McCarthy. There's also room for a bit of his own autobiography, including a surprising amount about his low sperm count, and a discussion of JFK's assassination. This lively book takes some unexpected turns, and although Bryan claims anyone can get into a good conversation at a truck stop diner, the ones he finds are especially entertaining. Instructive, too. (Mar.) FYI: Bryan praises McCarthy's prose but clams up about their meeting at a Mexican restaurant, except to mention that both fear for the future of good writing.